The DUP’s Sammy Wilson has reportedly said he does not believe the British military should intervene in Syria. He was speaking amid a renewed push for military action after last Saturday’s chemical attack in the town of Douma, which has been widely blamed on the Syrian government. 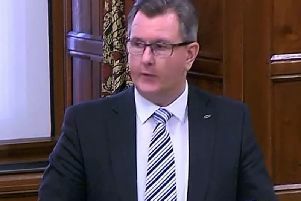 Mr Wilson, MP for East Antrim, said it would be a “significant step” for the Government to take and therefore should require a Commons vote. He is quoted as telling the Daily Mail: “I really think there should be a Commons vote on it as it’s a very significant step for the Government to take. There’s Parliamentary precedent on these matters but I suspect the Prime Minister’s already made up her mind. According to the website TheyWorkForYou.com, which monitors MPs’ voting records, in recent years Mr Wilson has voted in favour of military action in the Middle East targeting the Islamic State group in both Syria and in Iraq. Theresa May’s government is only able to guarantee its dominance in the Commons thanks to the support of the DUP’s 10 MPs, ever since the Tories lost their outright Commons majority last year.